No entry without pass? Last year it was free, and apparently always has been. Anyhow, we walked on a little further, and sure enough there was a guy set up with a table collecting money. $10 per group. Even if you are a group of one! And then you have to sign a ridiculous liability card. The land is owned by a land trust. I did some research and found a local news article talking about the new charge. They say that the place was getting too busy and this is their way of trying to reduce the number of people using the property. Well, it will probably work. I doubt I would go back again. It's a 4 km (2.5 mile) hike to a lookoff. My friend Dave, relaxing at the lookoff. Even with the $10 per group charge, it's still busy. Big price drop on this egg cooker! The conversation area at Dad's place is starting to charge a parking fee now, or will be very shortly! That should be *conservation* area! Maybe you could do the 7-day free trial for SlingTV and stream the game on your laptop. That is an idea, Kevin will have to look into that. Thank you! Would that be “conservation” area? lol! Maybe there is only someone there on the weekends when it is busier, especially a beautiful fall weekend! If they have someone there everyday, we agree that it doesn't seem to make sense unless it is a volunteer. It was interesting to read that Rock Dunder Nature Reserve was purchased by a private land trust from the Boy Scouts of Canada. It seems like the Scouts are selling off so much of their land both in Canada and the US. Never knew that the Scouts had land to begin with and that so much is being sold off but I guess is it is viable for them anymore then perhaps it just makes sense too. Yes, during the years of my youth, large corporations (particularly papermaking companies) would donate large tracts to the BSA and GSA for their campouts and jamborees. Nowadays, the Scouts are cashing in by selling some of those tracts. One tract down the road from us on the river was sold by the Scouts to a developer, and now it's a subdivision. I wish it had been sold to a public or private land trust so that it could continue to be forest. 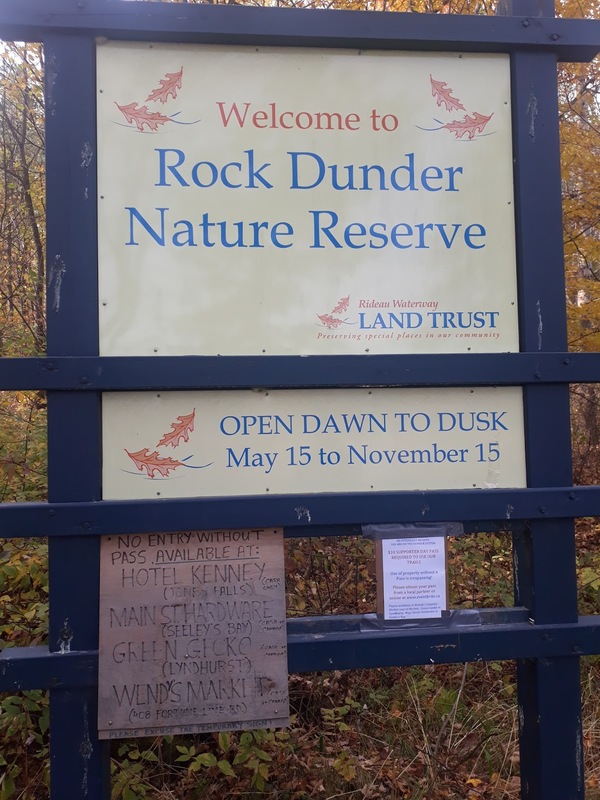 You are lucky; Rock Dunder will continue to be preserved for a while.